So, I told you I made scones when we had our superfun weekend in the Yarra Valley, and even though I'm not the greatest scone maker, I was so super pleased with them! They looked decent and they tasted great. Yay! 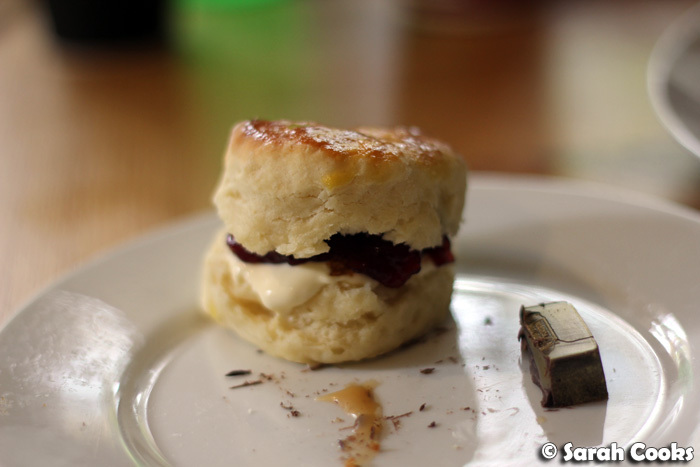 I said I'd share the scone story with you, and here it is. Those of you who have been reading my blog for a while will know that I haven't always had the best luck with scones. (For example: Nigella's free-form scones in Cambridge in 2006; Joanna Weinberg's scones in 2008; Belinda Jeffery's wholemeal buttermilk scones in 2010; and, last year, Nigella's buttermilk scones). Although I've been fortunate that they always tasted good, they seemed to turn out flat and slopey, or rough and ugly. 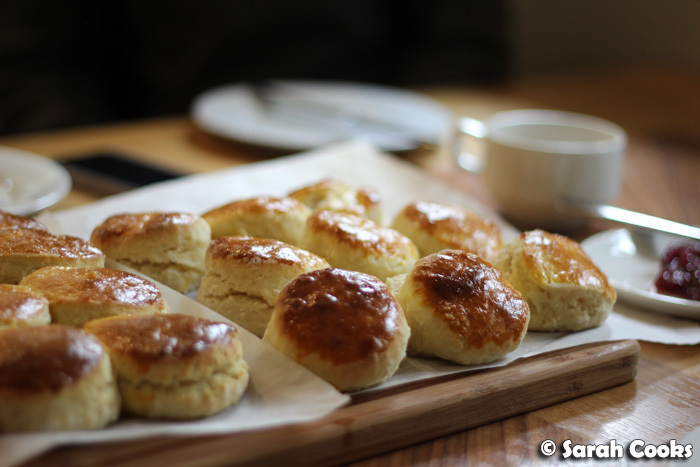 However, in April this year I had great success with the banana scones from the Raspberri Cupcakes blog and was very keen to try out her recipe for plain scones - I love that both recipes require you to stir cream into flour, rather than rubbing butter into flour. Easy! I also recently saw The Most Perfect looking scones ever on Fanny's impossibly pretty blog: Like A Strawberry Milk, which uses the traditional rub-butter-into-flour technique, but also has a really helpful list of techniques and tips to make perfect scones. She says you can use any scone recipe you like, but that incorporating her techniques will result in better results. So, I thought, why not try it? The measurements and ingredients from Raspberri Cupcakes, and all the techniques from Like a Strawberry Milk! The combined recipe, adapted from both sources, is included below for your (and my) reference, for the next time I feel like whipping up some fabulous scones! 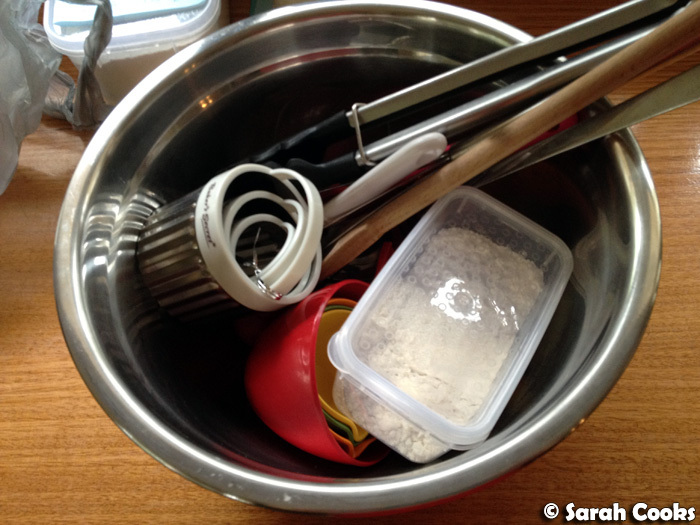 And in an uncharacteristic show of being organised, I'd pre-measured out the dry ingredients, so that all I'd need to do on the morning was stir in the liquid ingredients. Some of Fanny's tips are the same basic ones you read everywhere - you know, not overworking the dough, not twisting the cutter when you cut out the scones - but there were a couple of extra tips that really, really made these scones awesome! Here's the dough, gently patted together. ...but the underside is pretty and smooth. Such a small tip, but it makes a big difference! 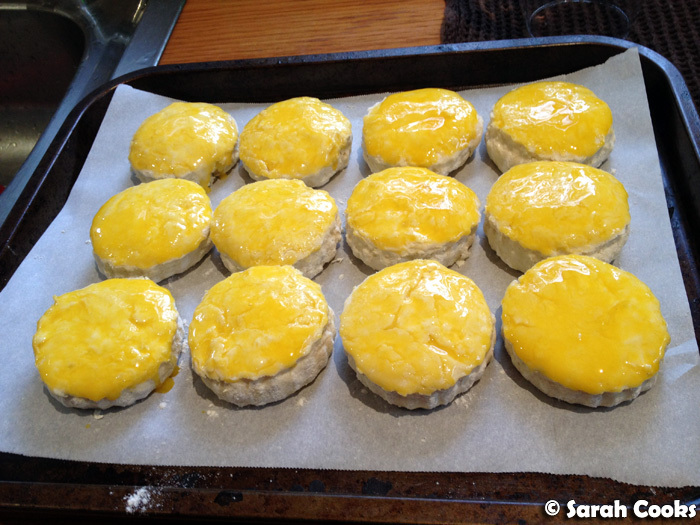 The other tip I loved was to double glaze the scones with egg yolk. I've used this technique before on pastry, having learned it at Carême Pastry in the Barossa, and it worked really well on these scones. There were a few slightly slopey ones, cut from the second round of dough, but most of them were nice and even. Woo-hoo! They rose satisfactorily, they had smooth tops, they were nice and shiny, they were round, and they were light and fluffy, with a lovely crust. They were everything I want in a scone! Super happy scone satisfaction - YAY! 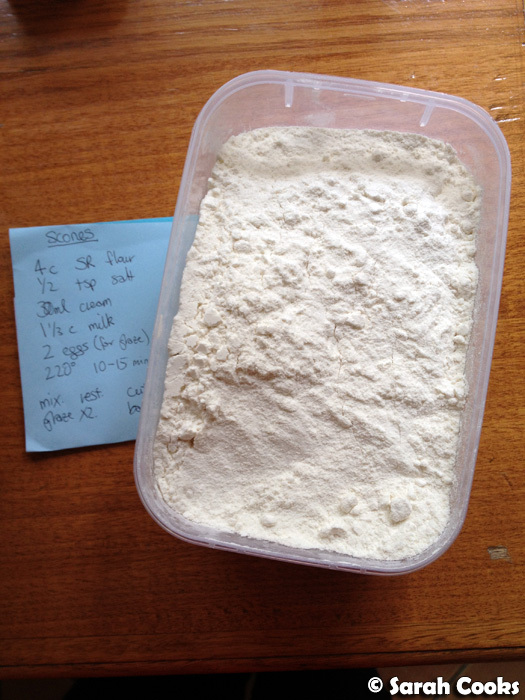 Sift the flour and salt into a large bowl. Make a well in the centre, and pour in the cream, stirring gently to combine with a large palate knife, or other flat bladed knife. Gradually pour in the milk, gently stirring all the while, until there is enough liquid to form a soft dough. (You may not need all the milk). 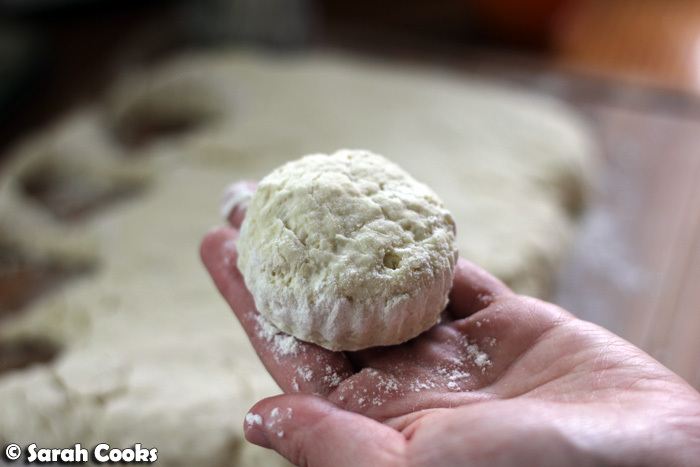 Place dough onto a lightly floured large wooden board, and, working gently, gather the dough together with lightly floured hands until it is just smooth. 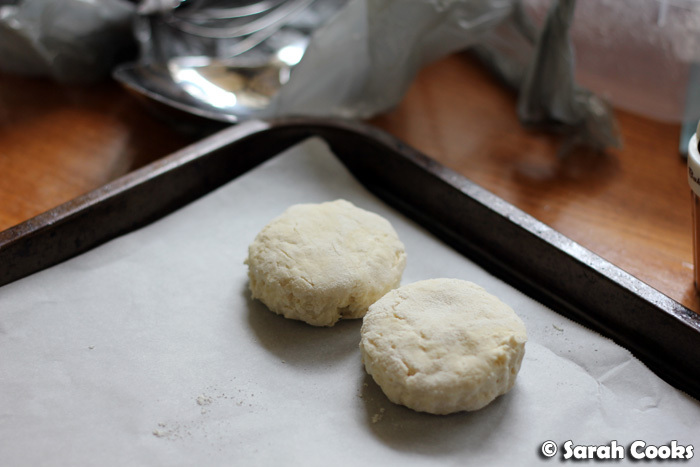 (Don't knead or vigorously work the dough, or the scones will become tough). 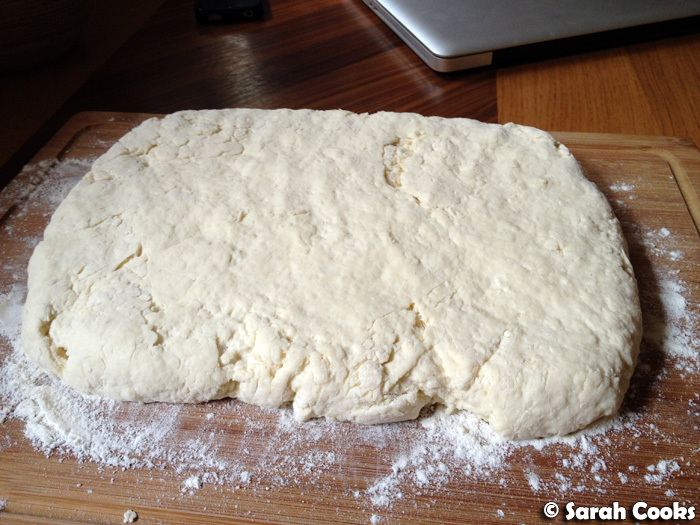 Pat the dough into a rectangle about 3 cm thick. Loosely cover with clingwrap and refrigerate for 30 minutes. Take the dough out of the fridge, and remove the clingwrap. Cut into rounds using a well-floured 5cm fluted cutter. Make sure to cut straight up and down, not twisting the cutter. As you cut each scone, flip it over to reveal the smooth underside, and place close together on a tray lined with baking paper. 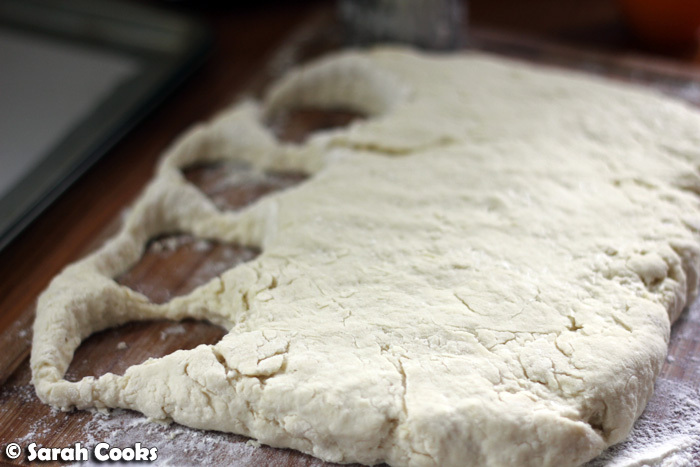 Pull the scraps of dough together and continue to cut until all the dough is used up. Place into the oven and bake for 10-15 minutes, until lightly browned and cook through. Allow to cool slightly then eat with lashings of jam and cream. They look marvelous! 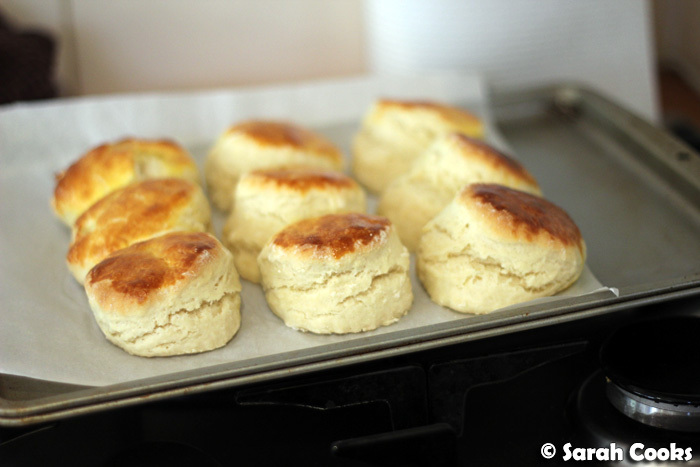 I recently made a batch of scones (look for the post soon :) ) but yours seem to have turned out so much better. Congrats on your scone success :) they look great! I'm always on the lookout for scone recipes so I may well give yours a try. They look great and fluffy. Another good recipe for a rich scone is Rachel Allen's from Bake. I only do lemonade scones, cos the one time I tried something else it didn't work that great! I so want to make this! 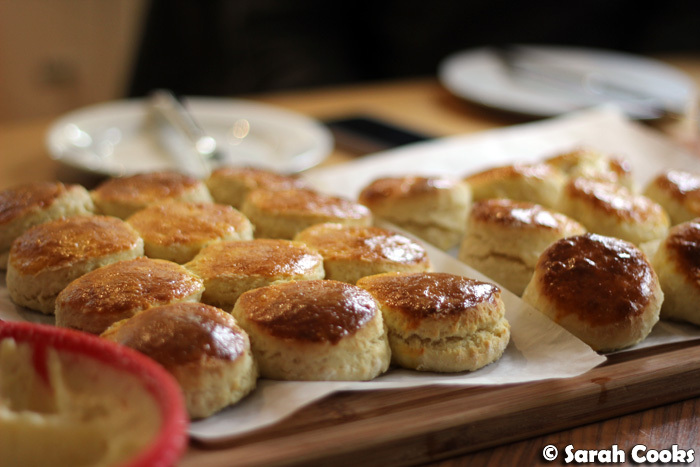 you have me craving scones at 6.30pm!